EFFINGHAM, S.C. -- Glory Farms vegetables, a McCall Farms brand, has been named a packaging finalist for the 2017 Gama Innovation Awards. The Glory Farms brand of canned premium vegetables changed their packaging earlier this year into a "see-thru" can, a style of packaging unprecedented in the canned food industry. The clear plastic can was developed in partnership with Sonoco Products, a global packaging leader. 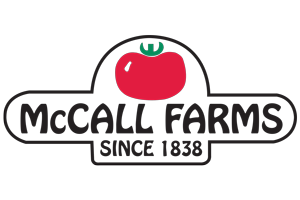 Woody Swink, co-president of McCall Farms, said the company is proud to be named as a finalist for this prestigious honor. "Our new Glory Farms See-Thru can is the most notable packaging innovation in canned vegetables since canning was invented in the early 1800’s," Swink said. "When the consumer can see the vegetables it not only says 'fresh' but also gives them a sense of trust because they see what they are buying. It’s truly, quality you can see." The Gama Innovation Awards recognize outstanding innovation in the Fast Moving Consumer Goods space, with finalists selected by Gama’s global network of in-country researchers and analysts. Gama Innovation Director Silvia Ruiz said they analyzed hundreds of products from over 40 countries, selecting only the ground-breaking few for consideration. The overall winner in each category of the Gama Innovation Awards will be announced in a ceremony to take place on Oct. 25 in Manchester, United Kingdom at Manchester’s Bridgewater Hall.